A single window for exchanges with North Korea is being formed by the South Korean churches. 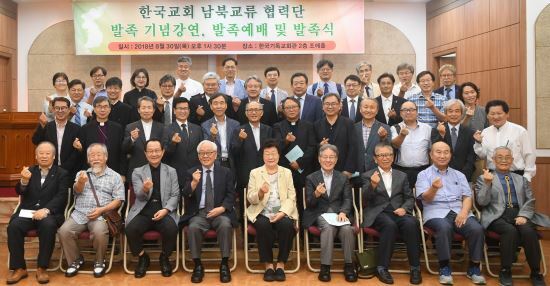 On August 30, more than 100 persons from the six member denominations of the National Council of Churches in Korea (NCCK) including Presbyterian Church of Korea (PCK Tonghap), Methodist Church of Korea (KMC) and Presbyterian Church in the Republic of Korea (PROK), as well as other church-related organizations, met at the Christian Building in Jongno-gu, Seoul, and held a worship service and ceremony to inaugurate the “Inter-Korea Exchange Group of South Korean Churches” (photo). The Inter-Korea Exchange Group has been established to carry out exchanges and other projects related to North Korea in an atmosphere of communication and cooperation. The object is to communicate systematically in cooperation with the Korean Christian Federation (KCF), which serves as the northern dialogue window, and to provide a framework within which to share information and dialogue for South-North exchanges. The group plans to request participation by major Korean church denominations also, making it a “single window” in both name and reality. The Inter-Korea Exchange Group is planning a discussion meeting by its executive committee this October, and an international ecumenical conference in December on the theme “The Way to North-South Life Together.” The Exchange Group’s co-representatives are Na Haek-jip, who chairs the NCCK Reconciliation and Reunification Committee, and Ji Hyeong-eun, who heads the board of the Korean Sharing Movement.